Information Processing: Greg Clark: Are there ruling classes? Using rare surnames we track the socio-economic status of descendants of a sample of English rich and poor in 1800, until 2011. 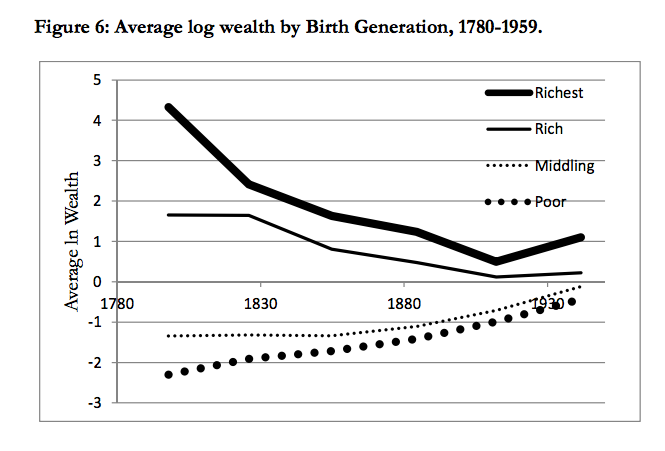 We measure social status through wealth, education, occupation, and age at death. Our method allows unbiased estimates of mobility rates. Paradoxically, we find two things. Mobility rates are lower than conventionally estimated. There is considerable persistence of status, even after 200 years. But there is convergence with each generation. The 1800 underclass has already attained mediocrity. And the 1800 upper class will eventually dissolve into the mass of society, though perhaps not for another 300 years, or longer. More discussion, including recent US data, here. Nathanael Weyl found that Americans named Clark, Clarke, and Palmer (i.e., whose English direct male line ancestors 700 years ago were "clerks" -- i.e., literate) were more likely found in highly literate occupations today such as writer or lawyer. Sounds ridiculous, but I'd like to see if anybody could reproduce his finding. That is exactly what Greg finds, across a variety of cultures. Doctors in Sweden and India, Oxbridge attendees in England, etc. 200 years is not enough time for an extended group to regress fully to the mean. This suggests an invisible dynamics of assortative mating and values transmission that operates in every society he's studied. Hm. Are people named "Smith" brawnier? This post requires that you comment on Charles Murray. If his analysis is true, then the social classes are currently diverging. You just can't throw this out there and walk away. It's possible that both Clark and Murray are correct. Clark's convergence may have stopped and reversed in the last 30 years due to globalization, meritocratic sorting, etc. Gintis and Bowles found that only a small portion of the inheritance of inequality can be explained by IQ heritability: www.umass.edu/preferen/gintis/intergen.pdf . However, wealth itself is significantly heritable so there must be other factors at play. The question is -- what are they? Compare class mobility rates over time in England, Sweden, Massachusetts, each of which has varying levels of social equality and educational success across all social groups.